Visit Barcelona at your own pace: hop on and hop off the double-decker tourist bus whenever you like! The Bus + Boat Tour is recommended for lovers of practicality and comfort. 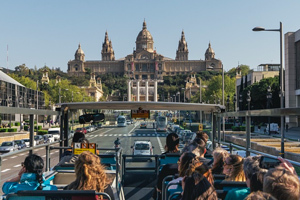 In fact, from on board a double-decker bus, it is possible to get a general overview of Barcelona and get an idea of how to find your way around the city with ease. The stops are all close to the main attractions and run every 7 minutes. There are two tours, (orange and green) which have been specially designed for tourists. In addition to this, on this tour of land and sea, there is also a trip included on a cruise which departs from beside the statue of Christopher Columbus (situated at the lower end of La Rambla at the Olympic port). Price for two days: - Adults €52.00 - Children €32.00 - Adults over 65 €48.00. The Bus and Boat sightseeing tour will enable you to get to know the city quickly and also from different perspectives. The public transport system in Barcelona is very efficient but nothing can compete with the comfort of a double-decker sightseeing bus. Forget about the darkness of the metro and the trips on board a bus that's crammed with people: let yourselves just be dropped off right in front of the main attractions. When you arrive on board the bus, you will receive a discount card and a map of the city on which the bus routes are marked giving a description for each stop so that you can decide in advance how long you want to make your tour when getting on and off the bus. The sightseeing buses have two different routes (the orange line and the green line) in order to ensure a really comprehensive tour of the city. The duration of each route is around 2 hours with 35 stops and a schedule that runs between every 7 to 25 minutes (depending on the season). You can opt to travel the whole route whilst listening to the audio commentary (which is available in 15 different languages). . In front of the stop at the "Statue of Columbus" on the orange route, you will find the BCNavaltours docking station from where you can embark on a fantastic tour of the coast surrounding Barcelona. This covers a delightful 40 minutes boat trip which will enable you to enjoy spectacular views of the city whilst relaxing and enjoying a drink which could be a glass of cava, sangria or a soft drink and other refreshments. The beauty of the sea around Barcelona and the stunning views will enchant everybody. The boat makes its trips daily from 11:30 to 19:30 hours from April to October and from 11:20 to 17:30 from November to March. Just choose the timing that works best for you! Tours are available every day.